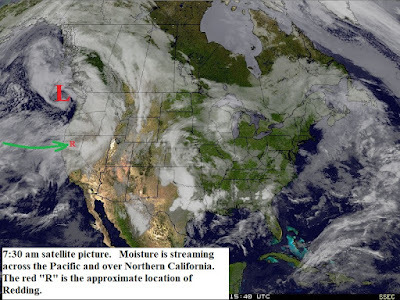 High pressure continues over the western U.S. The above normal temperatures will continue into the weekend. Skies will be mostly clear with some afternoon cumulus over the mountains with isolated mountain thunderstorms possible. Winds will be light. 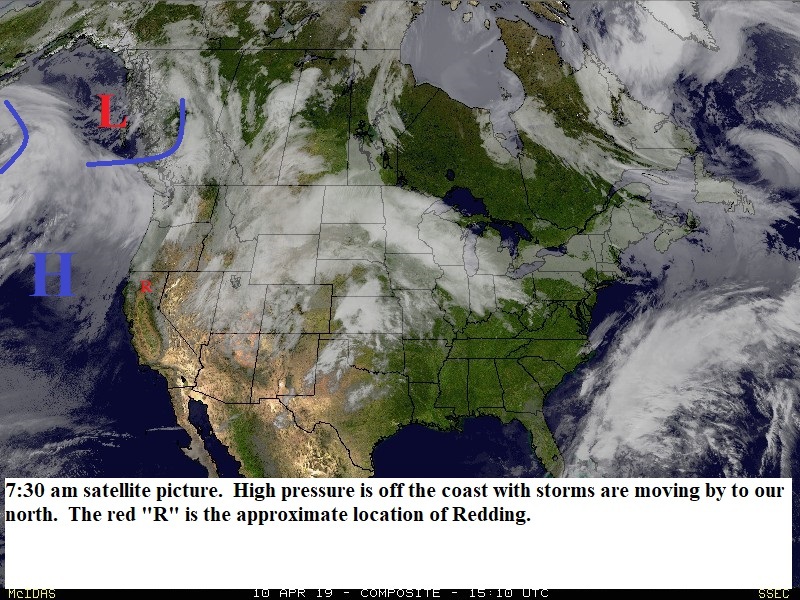 A high pressure ridge is over the western U.S. and will hold there through Friday (see map below) and then weaken slowly over the weekend. Today through Friday we will see sunny skies with some afternoon cumulus clouds mainly over the mountains. Tuesday through the weekend there is a chance of isolated thunderstorms over the mountains with a chance over the north valley Thursday and Friday. 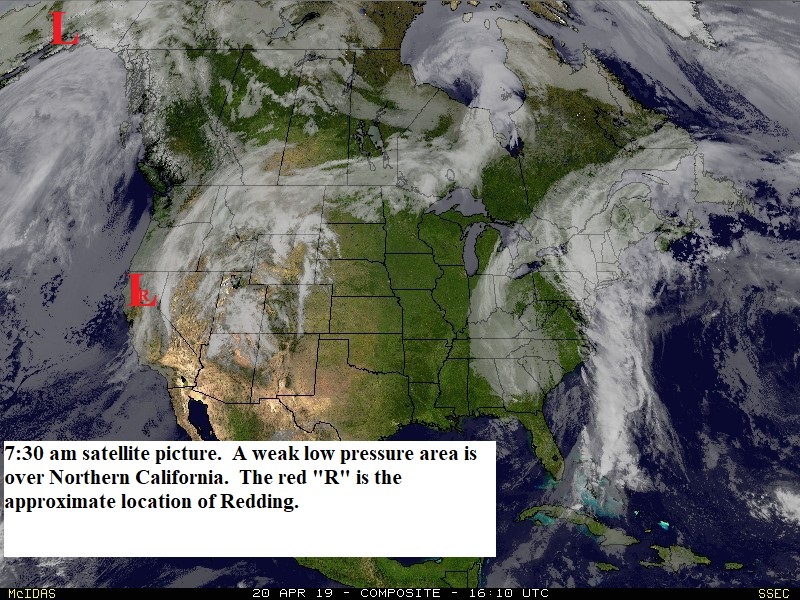 A weak upper level low pressure area is over Northern California and has triggered a few light showers over the higher elevations. Scattered showers and thunderstorms will occur today over the foothills and mountains with isolated activity possible in the valley. Sunday the low will be to our east. 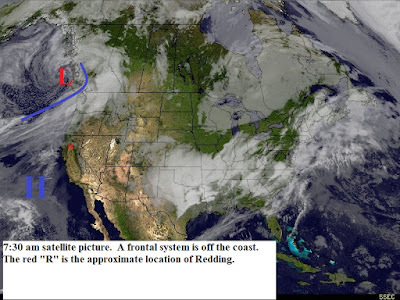 Sunday afternoon through Friday high pressure will be over the western U..S. (see map below). During this time the north state will be sunny with daytime temperatures 12 to 16 degrees above normal. There will be periods of gusty north winds. Temperatures will cool on the weekend as the high pressure ridge weakens. High pressure is just off the coast and as the map below will remain there for the next week. Most of the time Northern California will be sunny with a few clouds at times from low pressure areas moving by to our north. 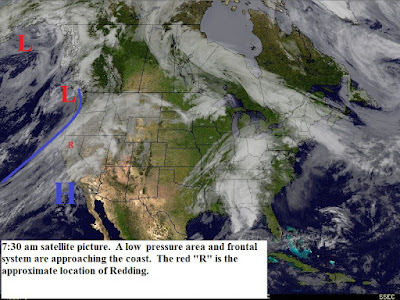 Friday and Saturday there will be a chance of afternoon and evening showers ands thunderstorms over the higher elevations north and east of Redding. Daytime temperatures will be above normal and there will be gusty north winds at times..
A low pressure area and frontal system are just off the coast. This system will bring light rain or showers to the north state later today and tonight. 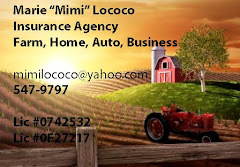 Snow levels will be 6000 fee or higher. Tuesday skies will be clearing as high pressure builds along and over the west coast. We will see mostly sunny skies with temperatures warming to 10 to 15 degrees above normal by Thursday. Light to moderate north winds will occur in some areas. Friday and Saturday we will cooler temperatures and a few clouds as a low pressure trough moves by to our north (see map below). 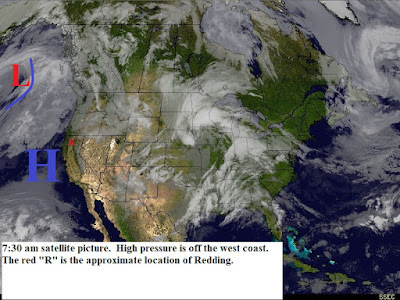 High pressure will rebuild along the coast Sunday and early next week. This morning's satellite picture (below) shows a weak frontal system off the coast. 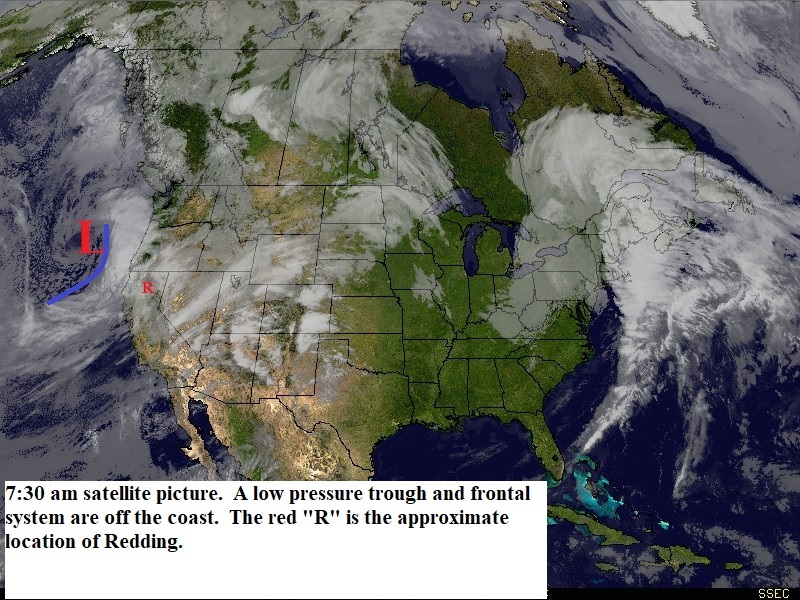 This system will spread a few clouds over the north state later today with a scattered light showers possible on the north coast and over Siskiyou and Modoc counties. A slightly stronger low pressure trough will move through the area Monday. This system will bring light rain or showers to the north state with snow levels 6000 feet or higher. Skies clear Tuesday as high pressure builds along and over the west coast. Wednesday through the weekend the high will be in place. We will see mostly sunny skies with daytime temperatures 10 to 15 degrees above normal. There will be periods of gusty north winds. The next 7 to 10 to days we will be under a weather pattern like the one shown on the map below. High pressure will be off the coast with the jetstream or storm track to our north. Most of the north state will be partly to mostly sunny with a few clouds at times as frontal systems move by to our north. The systems Thursday and Sunday could trigger a few sprinkles near the Oregon border. Temperatures will be a few degrees above normal and winds will be mostly light.